While the gas pedal may induce a thrilling ride (depending on what you drive) the brake pedal is what ensures that ride comes to a safe halt. Whether you�re on the track or following the daily path of your commute, there is nothing quite as important as a healthy brake system. A brake failure could spell disaster, but luckily your car will likely communicate an upcoming issue with one of several symptoms of trouble before it gets to that point. If you experience any of these signs you need brake repair head to the auto repair shop right away! Most likely the first sign of trouble that you will experience will be a grinding noise that occurs when you hit the brakes. This happens for one of two reasons. The first is that some brake pads are designed with a mechanism that creates the noise when brake pads are getting low. The second reason, which is far too common, means your pads have worn so thin that metal is grinding on metal! If the Anti-Lock Brake System (ABS) light on your dashboard turns on you�ll want to head to the auto repair shop right away. This can indicate several potential problems so a computer diagnosis is necessary to ensure the right repair is made before it turns into a bigger problem. When you apply the brakes the car should continue to travel straight down the road. If you experience pulling, where the car tries to go left or right on its own, when you hit the brake pedal you may have brake pads that are wearing unevenly. However it is also likely that this is caused by debris in the brake fluid or a stuck brake wheel cylinder. When you hit the brakes can you feel a vibration in the brake pedal or elsewhere in the car? This is generally caused by scratched or warped brake rotors, which is what brake pads grab and rub against in order to slow the vehicle. Warped rotors mean the pads don�t an even surface area to grab, which reduces braking power. If your brake pedal seems to need to be pushed further toward the floor in order to garner a reaction from the brakes, or if the pedal seems to rest lower than it use to, you likely have very worn brake pads. Unfortunately there are more dangerous problems that can cause this, such as air in the brake lines or even a brake fluid leak! Never delay getting your brakes repaired if you believe they�re having trouble! 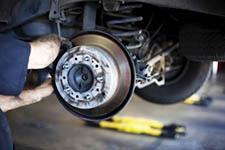 For expert brake repair in Asheville, NC, visit the team at The Organic Mechanic. We strive to provide high quality auto repair that keeps your car safe and reliable. To learn more about our team or to request professional auto repair in Asheville reach out to us at (828) 232-8120 today.